Located off Cass Road, 1/2 mile north of the intersection of South Airport Road and Cass Road (2200 Dendrinos Drive). 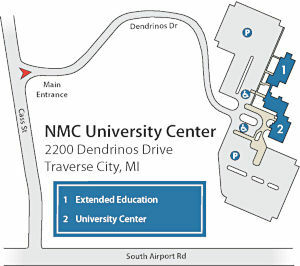 Some of our classes are held on this campus as well as other NMC campuses in Traverse City. Coming from the east on M-72: Turn left at the Acme stoplight onto US 31. Heading towards Traverse City on US 31, turn left (south) at 3 Mile Road. Follow 3 Mile Road south past the end of the airport runway until you reach South Airport Road. Turn right on South Airport and take South Airport until you reach Cass Road (sixth stop light, approximately three miles). Turn right (north) onto Cass Road. The NMC University Center sign is on the right, about 1/2 mile from the light. Coming from the south on M-37/US 31: Head north on M-37/US 31 into Traverse City to the large intersection at South Airport Road (near the Grand Traverse Mall). Turn right onto South Airport Road. At the third light turn left onto Cass Road. The NMC University Center sign is on the right, about 1/2 mile from the light. Coming from the north/northwest on Grandview Parkway/US 31: Turn right (south) on Cass Street. Continue on Cass through four lights and around a large curve. The University Center sign is on the left.